When Microsoft started hunting Yahoo in February, many assumed that the software behemoth would bag the company swiftly and efficiently. Yahoo seemed to be classic weak Web prey, wobbling financially while rival Google continued to dominate the online world. Now, just days after Microsoft's threat to take its modest offer directly to shareholders, Chief Yahoo Jerry Yang is fighting back. Rumors are flying that Yahoo is teaming up with AOL, the long-suffering Internet division of Time Warner (which is also the parent company of TIME), as a way to stave off an unwanted merger. At the same time, there are reports that Microsoft is buddying up with News Corp. so that the two companies can increase Yahoo's offering price and corner their catch. While many industry watchers still believe that Microsoft will gobble up Yahoo eventually, chances are it will have to pay a lot more for its meal. PROS: Microsoft has been losing money in the Internet space and desperately needs the tremendous reach of Yahoo, which is bigger than any other rival. Microsoft could swiftly sweeten its deal for Yahoo, with the extra resources from News Corp. Yahoo will likely enjoy a higher purchase price, which will satisfy its investors. Plus, Microsoft can then integrate Yahoo search and content into News Corp.'s MySpace (which lacks a built-in Internet search feature), making it a more serious threat to Facebook. CONS: News Corp and Microsoft may not work well together. In an April 10 report, analyst Jim Friedland of Cohen and Company predicted that the merging of these three companies would not produce a fruitful alliance. Instead of giving Microsoft a needed competitive edge, the merger might actually slow Microsoft's efforts to intensify its battle against Google. PROS: The combined entities are worth more together than they are apart, which is a plus for investors. Together, they would have the most instant messenger users, the buzziest celebrity news site (AOL's TMZ.com), a leading business site (Yahoo Finance), along with a popular tech blog, (AOL's Engadget). The cash infusion from Time Warner (in exchange for a 20% stake in Yahoo/AOL), would enable Yahoo to buy back some of its stock, which would likely elevate its stock price. 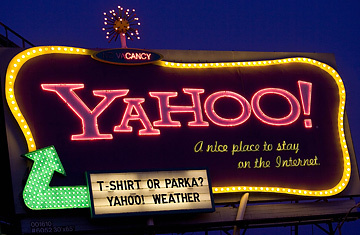 "The chief benefit to Yahoo is the avoidance of a Microsoft deal," notes analyst Greg Sterling. CONS: The obvious synergies may not work out as well as anticipated. With both Yahoo and AOL seemingly adrift in their revenue-building strategies, it remains to be seen whether the two struggling companies can successfully reignite their businesses by joining forces right when Web advertising sales have stalled. PROS: The combined audience and advertising networks of Yahoo and Microsoft might finally have a shot at knocking Google from its number one spot. What's more, the software giant would essentially control the entire instant messaging landscape, creating a new kind of interoperability that could lead to more innovation and a fresh revenue stream. CONS: Microsoft would have to shell out more cash for the combined company of Yahoo and AOL and deal with the complexities of integration. What's more, the current, three-way battle between Internet giants Yahoo, Google and Microsoft would be reduced to a two-way battle, which could stifle innovation. PROS: Yahoo can retain its independence and avoid the corporate ego blow of being bought by the Redmond, Wash.-based software giant. CONS: Yahoo's share price will continue to erode since it will be seen as a less-coveted property. While Yahoo could still seal a deal with AOL or continue to use Google's advertising network in order to prop up its revenue, the terms would almost certainly be less favorable for Jerry Yang and company. PROS: Yahoo just began testing out AdSense, Google's Internet advertising platform, on 3% of its search queries. Since Google is more effective at making money from search than Yahoo, this would boost Yahoo's revenue. That, in turn, would raise Yahoo's stock price and shareholder value. CONS: A more extensive partnership between Yahoo and Google will be challenged as anti-competitive and will almost certainly be thwarted on legal grounds. Microsoft has already begun lobbying Washington against such a move.